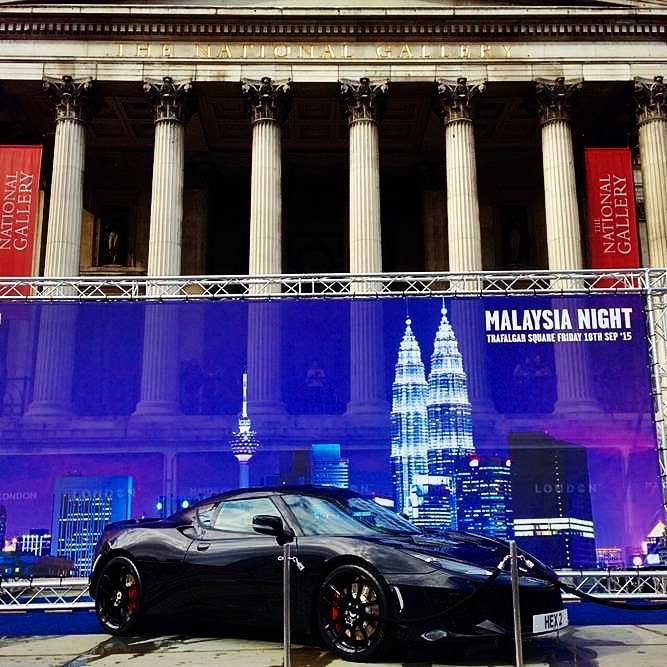 For the 6th year, London hosted the most vibrant and important event for Malaysian culture in theUK. On Friday the 18th September from noon to 10pm, Trafalgar Square became an open air market to celebrate Malaysian culture and its vibrant mix of music, food and entertainment. As part of the DRB-HICOM Group, one of Malaysia’s leading conglomerates, Lotus renewed its participation in the event for the second year running, after a previous successful attendance in 2014. Funded by the Malaysian External Trade Department (MATRADE), the event saw 53,000 people converge on Trafalgar Square in the centre of London. The Malaysian Minister for Trade and Industry, Honourable Dato’ Sri Mustapa Mohamed, and The High Commissioner of Malaysia to the UK, His Excellency Dato’ Ahmad Rasidi Hazizi, were also present to welcome the thousands of visitors and took time to visit the Lotus display featuring the new Lotus Evora 400. The new model from Lotus further enhanced the event as part of an impressive display on the North Terrace, in front of the National Gallery, overlooking Trafalgar Square. Visitors were invited to sit in the hand built car, experience the distinctive ambience and admire the handmade details within the cabin. Supported by the London-based Lotus dealer, Hexagon, interested parties also had the opportunity to enquire about booking a test drive and gain further information about how they might own a Lotus sports car, an iconic product of Norfolk, England.